You can’t get away from the fact that the brand new paved trail in the brand new OB Entryway Park does not connect with Robb Field. 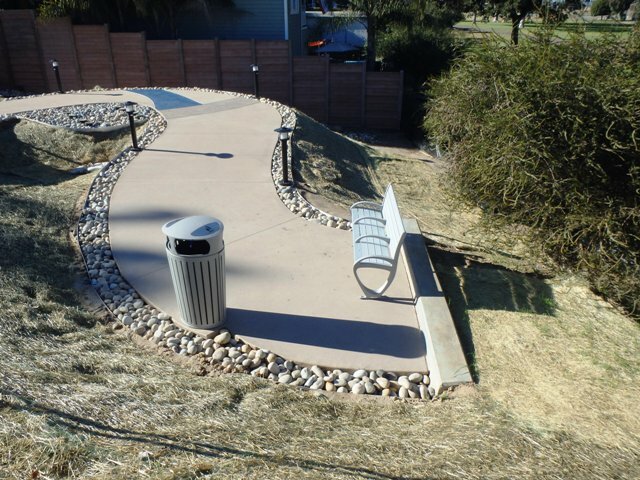 The new walkway ends abruptly near the bottom of the incline with a nice bench. But clearly, there is no trail or pavement or walkway that leads directly into the huge park that abuts this new addition to OB’s parks. 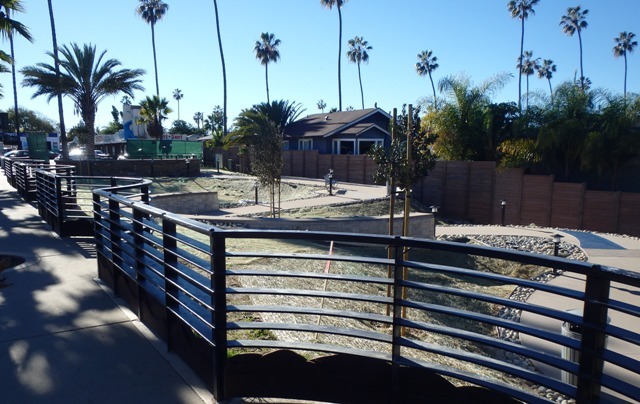 Most of the landscaping is yet to come in, as can be seen, but the paved walkway is complete, as it winds down from the circular entrance near the intersection of West Pt Loma and Sunset Cliffs Boulevard at the busiest entrance to Ocean Beach. You’re not supposed to be in the little park yet, and the walkways are blocked off with sheets of plastic. But one can wander in from the bottom. You can see from the sidewalk above that there is no connection between the parks. What? This is a huge disappointment for the community of Ocean Beach and for all the locals and visitors who would like to enter Robb Field from this angle. We’re certain the folks at the OB Community Development Corporation are just as frustrated at this lack of follow-through. 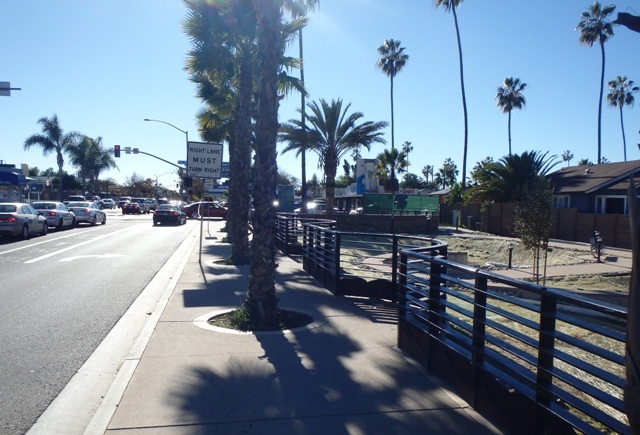 The community and developers and their contractors were all very careful in complying with the regulations of the American Disability Act when constructing the walkway. 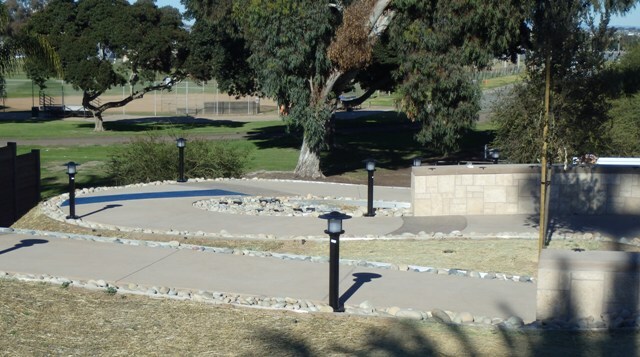 But now that the ADA-compliant walkway does not connect with Robb Field, everybody who comes through here will be forced to use the VERY NON-ADA-Compliant and very steep asphalt trail that leads from the sidewalk off Sunset Cliffs Boulevard down into the green lawns and playing fields of Robb Field. This is the City’s problem and issue. 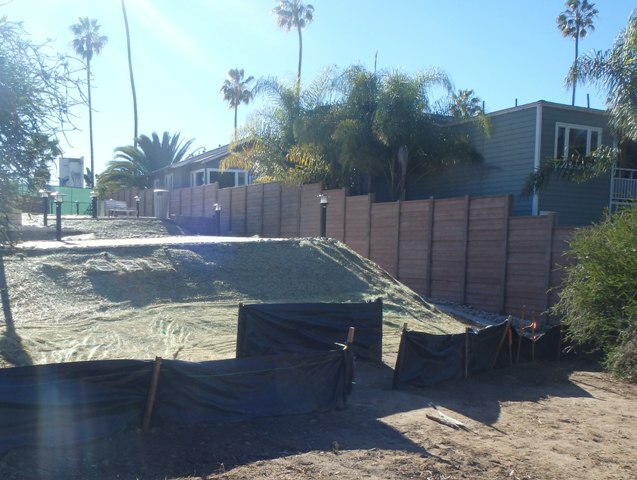 Everybody thought and were led to believe that the Entryway Park would solve this problem, of the construction of an alternative to the current asphalt strip that challenges every parent with a baby stroller, every senior and every person with disabilities. The steep, asphalt strip has been there for decades and everybody just takes it for granted. But it clearly is not ADA-compliant – yet the City just allows it to sit there. And now that it is crystal clear that the current Entryway Park walkway does not connect, the contradiction is just too much. 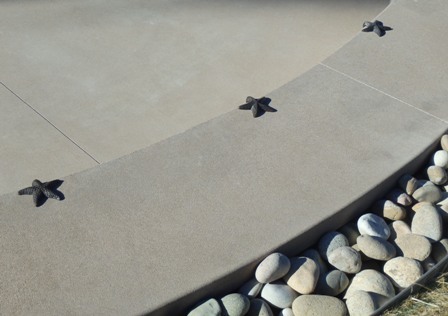 How could all this money be used in order to make an ADA-compliant paved walkway with the cute little stars on the concrete walls (to curb the skateboarders, no doubt) that meanders down the small hill and does not continue into Robb Field? 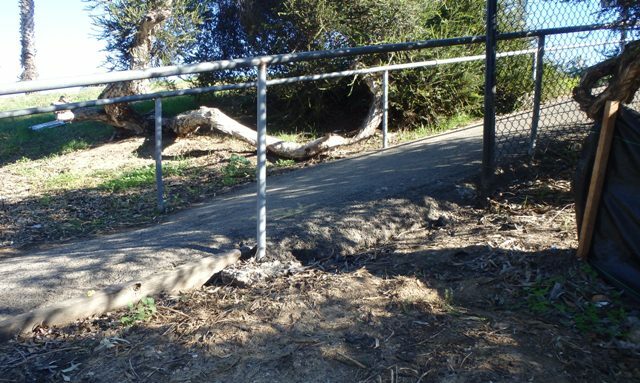 How can the City be allowed to continue to force residents and visitors to use the very non-ADA compliant asphalt trail that now connects to Robb Field? The City cannot be allowed to get off the hook here, just because community groups took the lead in developing the Entryway Park. None of this makes any sense to us. Problems have plagued this project from the get-go. 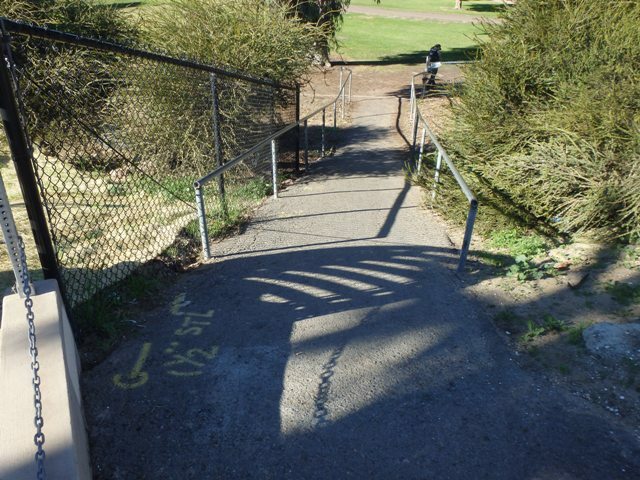 And now this absolute failure in planning and carrying out something the community sort of wanted – connecting the two parks with a simple walkway represents a break-down in something. We’re not sure what. Where and when were the park’s plans changed? Perhaps, as our good friend Chet Barfield and former council aid suggested, someone ought to come in and just do a guerrilla type of operation and install a freaking pathway, OB-style. The main function of this whole “park” project for many was supposed to be a better path into Robb Field. A path that actually connects to the cross-walk and is not so steep. The landscaping is secondary. People will just walk past the end of the path anyway, tramp down the landscaping and make their own ‘herd path’. If the OBCDC is unhappy with the result of this project where are they making that known? This is the government at its best. Taxpayer money created a path to no where. I think this is an embarrassment to many. The OB RAg wasn’t I don’t think trying to single out any local group, except the city. When I commented on this lack of connection in an earlier post, I was really hoping someone involved with the project would come back with information about a Phase 3 that would involve making the connection. Perhaps that will happen with this article and the comments. But, if this is the end of the project, someone, or ones, should have their butts kicked. I have to believe there is a future plan to do this but it will be more expensive because a contractor will have to mover back on the site. It would have been the least expensive had it been done in conjunction with the recent work. 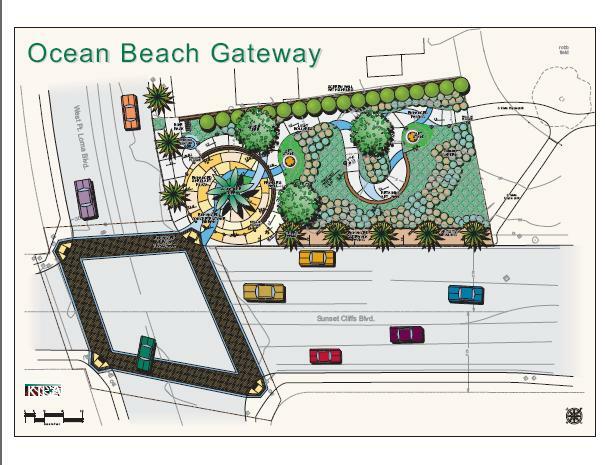 I am flabbergasted to see that there really is no plan to connect this entryway to the park as yet. And the article said that Parks and Rec took over the project so there should not be a stumbling block to completing this entry. Whatever OB town leaders that are involved in this have to get on the ball and get this done. This reminds me of the Winchester House with stairs that lead to nothing. Reminds me of china’s ghost cities that look nice and fit govt requirements, but nobody uses. A wasted of resources. Reminds me of the bullet train that would drop people off by a busstop in north LA. This meets the requirements of the bill voters approved but not isn’t very practical to use. Reminds me of the soviet joke about how bootmakers were ordered to make as many boots as possible at the lowest cost. They were all the same size and for the same foot. My husband and I walk through the entryway now to get down to Robb Field. Yesterday I notice weeds growing tall and plenty. Does anyone know who is responsible for continued maintenance of this area?